It’s quite common when Sai Baba groups meet up for events etc. that people bring their unwanted spiritual books and Baba-related items so that others may reap the benefits from them. Normally, the books and photos etc. are placed on a table near the entrance to the hall and anyone can browse and help themselves. A few years back I availed myself of a few of someone else’s unwanted books and on opening one of them I was amazed to find a photo copy of an A4 sheet of paper with the most incredible words of wisdom from Swami; the original had been hand-written very professionally in a lovely calligraphic style. On reading the words it was apparent that they were tailor-made especially for me, but specifically, the second paragraph contained the most beautiful and striking statement; “I will protect you like the eyelids protect the eyes”. I found this to be true on Monday 6 August 2012. I had been agonizing over recording a CD of mantra chanting. Nothing wrong with that, but considering that the finished product would be available for sale, it somehow didn’t feel right; a bit like a Christian taking stuff from the Bible and putting it out on Amazon for personal gain. But I knew that my intentions were good, for reasons not relevant to this post, and I also asked a few friends who confirmed that I should go ahead with it. So I made arrangements to use DB Studios in Stroud, Gloucestershire here in the UK. I arranged a recording session with my friend Chris, who is a partner in the studios, for mid-day on Monday 6 August. Stroud is about ten miles from where I live in Tetbury and I set of at about 11:30 a.m. in great anticipation. I’d decided on the mantras I was going to record and during the course of the drive to the studios I went through them. The main reason for this was so that my throat would be warmed up sufficiently for the recording. I quite often chant whilst driving, but not to this extent. In between Tetbury and Stroud is the small market town of Nailsworth and the road out of Nailsworth connects direct to Stroud; a distance of about 4 miles. For the first couple of miles there are a number of industrial units and showrooms at various intervals on the right hand side. One such showroom sells pine bedroom and garden furniture and is about two miles along the road. I had just started my second rendition of the mantra Om Purnamadah Purnamidam Purnat Purnamudachyate when I just happened to notice a red car waiting to pull out from the pine showroom onto the main road. It all happened so quickly but at the same time it seemed like slow motion. It was as if the driver deliberately waited for me to pass that point before pulling out; but in truth I doubt that he or she even noticed me. I didn’t even have time to hit the horn but managed to swerve the car to the left and avoid a collision. Luckily there was room for me to do that. Had the road been more narrow I may not have been able to. Of course the whole event took me by surprise, and I won’t say what words were coming out of my mouth at this point, but they were not mantras. However, I knew that once again The Avatar was at play and I very soon had a big smile on my face as I resumed chanting. It just goes to show that when you are engaged in God’s work, Divine Spirit will do whatever is necessary to ensure that the work gets done. This was also further proof for me that my intention to record a mantra CD had received the highest approval. The recording session went well too and I hope to have the finished product available sometime in October. For your interest, there is a you tube link below to the mantra Om Purnamadah Purnamidam Purnat Purnamudachyate. It’s truly beautiful and I hope you enjoy it. 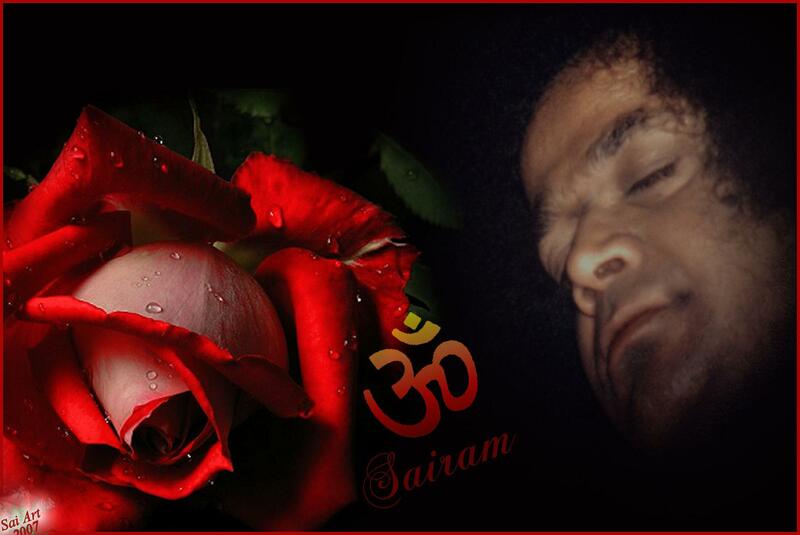 This entry was posted in From The Heart and tagged Bhagavan Sri Sathya Sai Baba, divine spirit, i will protect you like the eyelids protect the eyes, mantras, Nailsworth, Om Purnamadah Purnamidam Purnat Purnamudachyate, Sri Sathya Sai Baba, Stroud, Tetbury by Bloggin With Rich. Bookmark the permalink. It’s a strange feeling when you know someone/something has intervened. I had a close call myself last year and my car ended up in a ditch – it could have been a lot worse but I really do believe I was being ‘protected’ that day. I’ve only had one other accident and that felt very different. So I can understand how you ended up with that smile on your face Richard – but I bet you were really shaken up! Glad to hear someone was there for you ….. ensuring you got ot that studio!